Are floaties safe to rely on? The simple answer to this question is no. We would like to take this opportunity to explain why floaties are not safe to rely on as a means of supervising or protecting your child in the water. 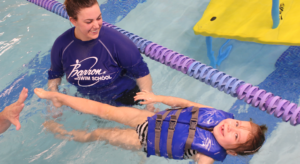 Many experts in the swimming industry including Barron Swim School, believe swimming aides such as floaties provide very little benefit to our children when it comes to teaching them the skills needed to be safe in the water. It is so important to remember that floaties do not serve as a replacement for supervision. One of the main reasons people flotation aids is because they think they do not need to be with their children. Nothing could be further from the truth. Kids who wear floaties all of the time may forget that they do not have them on after a break from the pool and may assume they are wearing them and jump into a pool. As a result, they may jump into a pool without them, leading to a very dangerous situation. Floaties have a tendency to slip down or can be pushed off when jumping in or possibly become submerged unexpected, leading to panic. Floaties can create a false sense of confidence for both children and parents. You may think your child is comfortable being in the water, yet they are only truly comfortable when they are wearing floaties. They swim with more confidence because of the security they feel wearing the device. This kind of thinking can be dangerous. Floaties keep a swimmer in a vertical position in the water. It is an inefficient way to attempt to move in the water, and your child could regress in their swimming ability. *The best supervision is you being in the water with your child. What does Barron Swim School recommend as a personal floatation device? We highly recommend US Coast Guard-approved life jacket (shown below). Click here to view or purchase a coast guard approved life jacket that we recommend.